DairyNZ has invested your levy in research to find solutions for reducing nitrogen (N) leaching while maintaining farm profit, particularly through the Pastoral 21, Forages for Reduced Nitrate Leaching, Southern Dairy Hub, and Low-N Livestock initiatives. The N cycle shown here explains how solutions, developed through these projects and previous research, work to reduce N leaching. Visit dairynz.co.nz/research for results and key messages from the research. What is the N cycle? 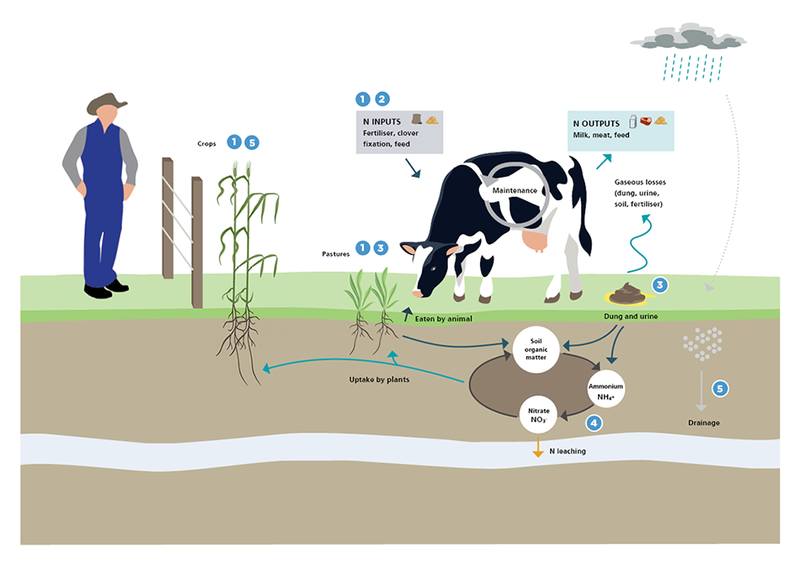 This N cycle graphic below shows how N inputs from fertiliser, feed and the atmosphere (through clover fixation) move from the soil to the plant, through the animal (using some for maintenance, growth and milk production), and out through urine and dung. It then moves back into the soil, where it is incorporated into organic matter or taken up by plants. Nitrogen is exported from the cycle via products (milk, meat and feed), and lost from the cycle via gas (volatilisation) and drainage (N leaching). How does N leaching work? The difference between the N inputs and N outputs is called the N surplus. The whole-farm risk of leaching increases by 0.2 to 0.4kg N/ha for every kg increase in the N surplus. Leaching happens when plant demand for N is low relative to N supply (e.g. in urine patches, or after a crop is grazed), and when drainage is high (e.g. high rainfall, overirrigation, and on free-draining soils). Reduce fertiliser and/or feed N inputs and match feed demand (stocking rate, culling and dry-off strategies) to the new feed supply to reduce the farm N surplus. Dry off cows early in autumn to reduce urinary N leading into winter, when drainage occurs and pasture growth is lower. Feed a low-N supplement such as maize or fodder beet instead of grass silage or kale, especially during the high-risk autumn/winter period. Apply smaller and more timely N fertiliser inputs. Avoid late autumn/winter applications. Note: with lower-N fertiliser, more N will be fixated from the atmosphere by clover (Overseer assumes 0.4kg from fixation for every 1kg reduction in N fertiliser). Use stand-off facilities and spread effluent when plant use is high and the risk of drainage is low. Manage the size of the effluent area to prevent oversupply of nutrients. Plantain pastures have been shown to dilute the concentration of N in urine – spreading it over a larger area. Adding salt to the diet has also been shown to have this effect. Research into these solutions is ongoing. Some animals naturally excrete less N via their urine. A new seven-year study is underway to determine if this can be incorporated into a genetic trait (see article page eight). Organic matter holds onto N in a stable form but cultivation can cause the N to be converted to a soluble form and lost. Minimum tillage techniques such as direct drilling of crops and pastures will reduce N loss. Some research indicates the roots of plantain pastures may be slowing the conversion of ammonium (the N found in urine) to nitrate (the N that is lost), giving the plants a greater opportunity to use the N before it is lost. Research into this is ongoing. Manage irrigation to prevent over-watering and maximise plant growth and associated N uptake. Use winter active species such as Italian ryegrass to maximise N use in the high-risk months. Follow winter forage crops such as kale and fodder beet with catch crops such as oats to mop up the excess N.
DairyNZ is a partner of the Southern Dairy Hub, along with AgResearch and the Southern Dairy Development Trust. The hub was established in response to Southland and Otago farmers wanting dairy challenges in the region to be addressed through local research and demonstration.